This range features the MECH keyboard, the REAPER mouse and the PULSE-R headset; and, as the title suggests, all those items feature aluminium somewhere in their design. It also covers all the bases so if you were absurdly wealthy you could buy the entire range and put together your gaming setup from shiny matching peripherals. This has a recommended retail price of £150. It’s pushing the upper price limit for a fancy gaming keyboard, though that’s still a reasonable price considering it looks quite well built and has a few decent features. The specs mention a polling rate of 1,000 hertz polling rate, which is definitely fast but won’t make any noticeable difference from other gaming keyboards because most of them already have high polling rates and nobody can type that fast anyway. 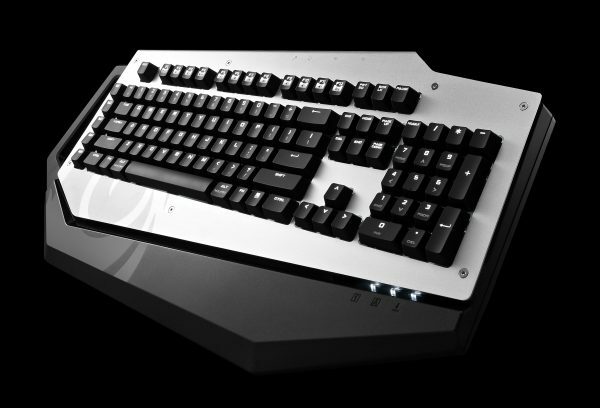 It weighs around 1.6 Kg, and that’s in line with other gaming keyboards. Aluminium is a light material, and I imagine it gives a more solid feel to the keyboard. It has rubber coating on some areas, so it should be able to take a few knocks too. The press release also mentions that the front plate is removable so if you end up spilling coffee over it, at least it’s easy to take it off and clean it. Lastly, it has a handle, which would come in handy if needed to carry it around and take it to tournaments with you. This has a recommended retail price of £65. Like the keyboard it’s got a removable aluminium shell and rubber coated areas. It has a 8,200 DPI laser sensor, and that precision is adjustable on the fly with buttons above the scroll wheel. That doesn’t seem the best place to put them because I’d be too worried of accidentally pressing them while scrolling, thankfully the button layout can be reconfigured according to the user’s preferences so it’s not a problem. There are 8 buttons to assign to various things so you’ve got lots of room to play with different combinations. 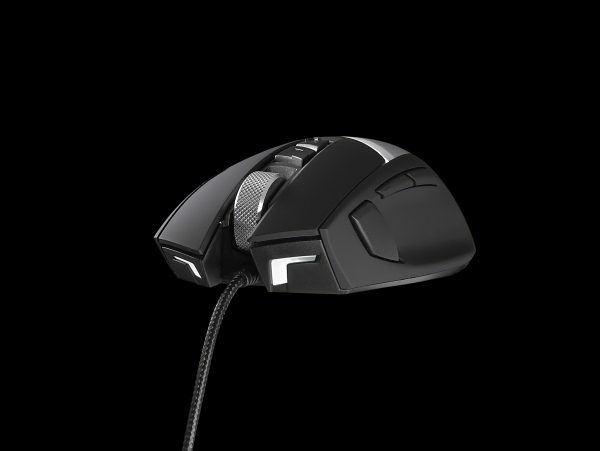 The mouse also has a 1,000 hertz polling rate, and for a mouse that’s high enough to eliminate most lag. It’s a wired mouse, attached to the computer with a braided, 1.8 metre long USB cable. The USB connection is gold plated, and while that’s not likely to make any significant improvement to your connection there’s nothing wrong with a bit of swanky mouse bling. Lastly, it has some white LEDs in the front which can light up when you click the buttons. In case it’s not already obvious, both the mouse and keyboard are designed ergonomically for right-handed people. There’s no word on a left-handed option. This one will cost £75. Same deal as the mouse and keyboard: rubber coating and some aluminium plating which can be removed. The press release says it’s “optimised for gaming with clear highs and powerful bass”. I don’t understand why games specifically need a powerful bass, it doesn’t matter, they’re just good speakers. The headphones also have LEDs which can light up to “intimidate your foes”, it depends how strong they are because they could turn out to be really distracting. There’s a light inside the microphone too, for lighting up your mouth, I’d like to see it in action in a gloomy room, it could look either very creepy or very cool. 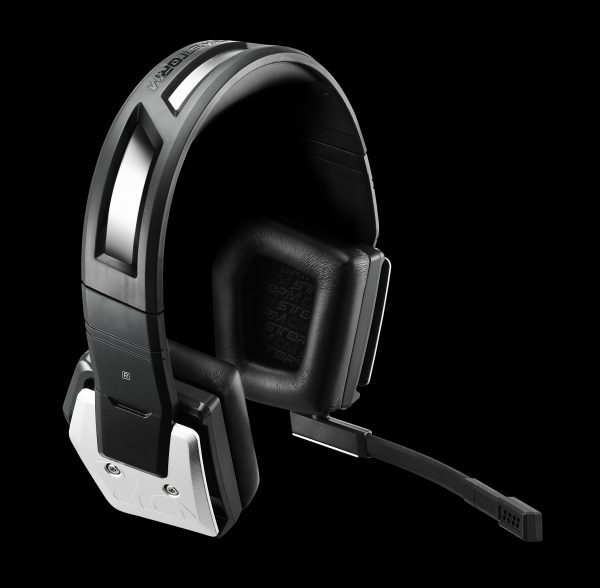 The ear cups seal off outside noise and the microphone has a noise cancelling system. The microphone looks sturdy, and it’s detachable. The press release says it’s USB-powered, and that cable would plug in to the left speaker just behind the mic. There’s a remote which is presumably attached to the USB cable, I’m not sure. I think the headphones themselves are wireless, but it’s unclear.